I've never been much of a 'marketer'. Shipping - creating a product and getting it live - has never been an issue. But actually getting people to use and pay for my products has always been difficult. From discussions with other developer-friends and having seen a lot of products come and go over the years, it seems like this isn't a problem that's unique to me. And I think it's because the marketing side of things just doesn't excite us. Our validation that we've created something good doesn't come from the exposure or user count but rather our instinct and feeling. Now, after almost a year building, running, and selling a product, I can admit that this is a pretty naive approach. Customers don't grow on trees. They don't fly down from the clouds and into your wallet. If you build it, it doesn't mean they will come. Metorik is almost a year old. Up until now, all of its growth has been organic. The cost to acquire customer has been $0. That's every product-makers dream. But now, as Metorik starts to mature and I can confidently onboard 100's of users a month, I want to invest more in marketing. Tweeting about Metorik from both my personal account @bryceadams and Metorik's account @metorikhq. 'Behind the scenes' content about building Metorik. 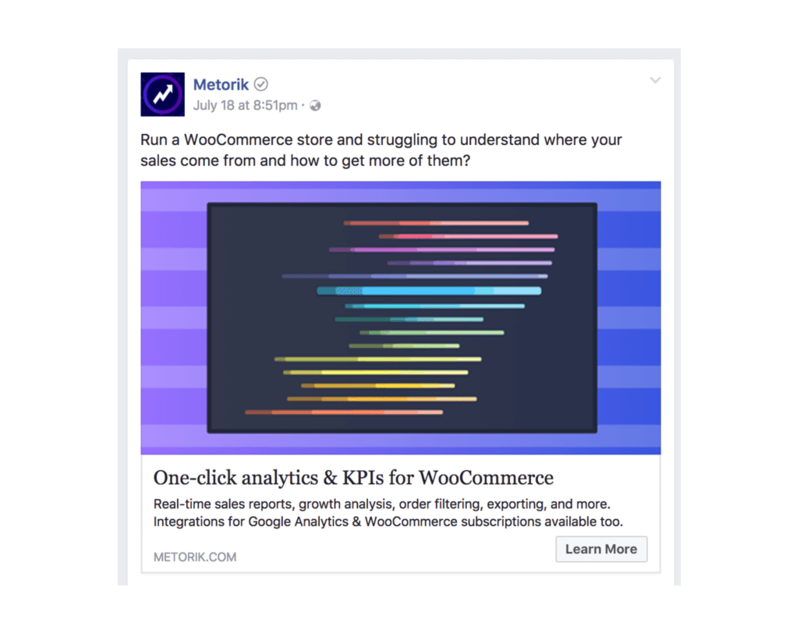 Outreach on WooCommerce-related Facebook groups. Launching 'the grand experiment' (creating a WooCommerce store from scratch and blogging about it). The best thing about all these marketing methods is that they were free! I literally spent nothing but my time on them (well, besides for the dog collars). But my time doesn't scale. 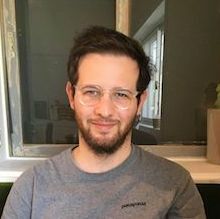 If I want Metorik to go from 100 customers to 1000 customers, I need to either be very patient, very creative, or do some paid advertising. I'll go with paid advertising. I didn't want to go the standard route of setting up Google & Facebook ad accounts, targeting keywords like 'woocommerce reports', and effectively burning money. While it was naive to think that I could get away without marketing, it's even more naive to think that paid advertising is easy and simple. I decided to try Facebook first. I'd already set up the pixel (what Facebook uses to track visitors to your site/app), so I had a good supply of people to advertise to (retargeting). Additionally, while both Google & Facebook's advertising tools can be pretty difficult to use, Facebook's definitely seemed easier. So there's this concept you've probably heard of called 'retargeting'. In fact, you've very likely experienced being retargeted to before. It's pretty simple: you serve ads to people who have already been to your site and/or expressed an interest through other means like email marketing. The idea is that those who are already familiar with your product (but have yet to sign up), are more likely than complete strangers to engage with your ads and sign up. I'm all about the retargeting. I think it makes complete sense for both advertisers and users, especially with niche products like Metorik. If I did more generic advertising to people interested in e-commerce, I'd risk having my ads served to Shopify or Magento users (who can't even use my product at the moment). I've been running ads through Facebook for the past couple weeks and the results have been quite good, but I think there's a lot of room for improvement. The advantage I have with Metorik is that my average revenue per user is quite high, since users have to pay a minimum of $200/year to use it (with most paying a lot more than that) and I don't have much churn (once people start paying for Metorik, it's rare that they'll stop). That high ARPU means I can spend a lot more than other products to acquire a user. If it costs me $100 in advertising to convert one customer, that's acceptable, since I'll likely make back that $100 (and then some) over the customer's lifetime with Metorik. I've experimented with both landing pages and regular blog content. I think there's a lot of room for improvement here, once I can determine what works best and then just keep doing more of it. I'm finding the advertising process to be quite similar to product development. It's all about learning, trying, and then iterating again after the results come in. I don't want to put all my eggs in one basket though. I'm also trying to do some personal outreach (cold emails, contacting big stores directly) and investing more in blog content/educational material. In a future behind the scenes post, I'll revisit some of the topics discussed today and the results! I'm sure I'll be willing to invest even more into it once I see the users clicking on ads actually sign up and start paying.